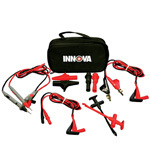 Household uses include: outlets, fuses, wiring, general-purpose batteries, electronic hobbies and more. Protective rubber corner guards for drop protection. 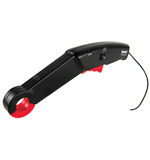 Includes attachable test leads, holders and stand. Does the 3320 Auto-Ranging DMM have a low battery indicator? Yes. The 3320 Auto-Ranging DMM will display a battery symbol on the LCD when low. Does the 3320 Auto-Ranging DMM have a fuse? Yes. The 3320 comes with a 0.315A/250V - UL Listed Bussmann, GMA Type (Radio Shack GMA/270 series; #270-1046 ) fuse. Does the 3320 Auto-Ranging DMM automatically power off? Yes. The 3320 Auto-Ranging DMM will shut off after being idle for 15 minutes. How can I access the batteries? You can access the batteries by removing two screws on the back of the 3320 DMM. What size battery does the 3320 Auto-Ranging DMM use? 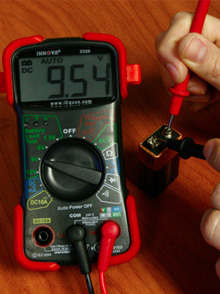 The 3320 Auto-Ranging DMM uses two 1.5V AA batteries. 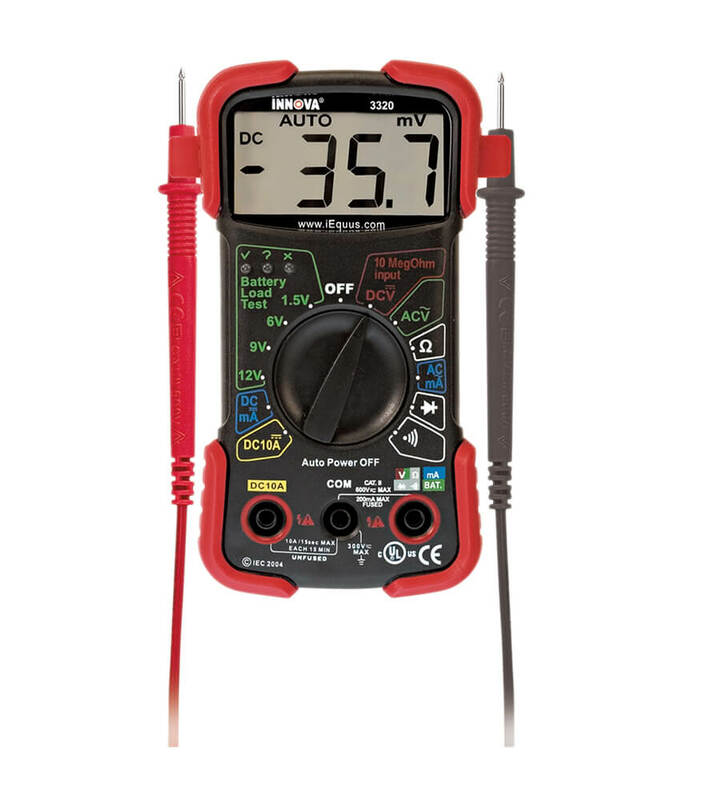 Can the 3320 Auto-Ranging DMM measure DC current (AMPS)? 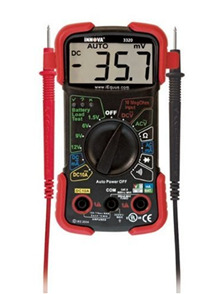 The 3320 Auto-Ranging DMM will measure 10A (DC from 0 to 10 amperes). Unfused DC current (AMPS). * A waiting period of at least 15 minutes is necessary between every 15 seconds testing period. Does the 3320 Auto-Ranging DMM have Reverse polarity protection? Yes. The 3320 Auto-Ranging DMM has Automatic negative (-) polarity indication symbol. Why do the numbers keep fluctuating when I'm not testing anything? This is a normal function of the Auto Ranging feature of the 3320 DMM. It is simply picking up signals from the environment around it. You can zero it out by touching the two test leads together. When conducting a test, the meter will automatically zero out before giving a reading.